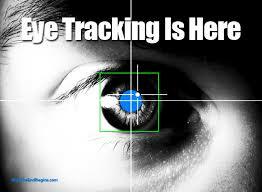 Eye Tracking Technology is a leading-edge technology which has been on the forefront of IT research for many years. The objective is to be able to control functions of a device, be it a computer or a mobile, by tracking the motion of the eyeballs. It has lot of applications in many areas and that is the reason it has rapidly become fame in scientific, business and medical domains.